Relax and reenergize as you bring back to life your tired and weary body with Marriott Hotel’s ultimate Escape! Spa Package. For only $220 net single or $245 net double, spoil your senses at the Quan Spa, where you can enter to a world of restoration and look forward ending your day to the Marriott Hotel’s luxurious deluxe room accommodation. The package includes an indulging daily buffet breakfast at the Marriott Café and an hour of massage of choice at the Quan Spa, where water element comes to life. Must-try is one of Filipinos famous service—hilot, considered as one of the best-loved treatments where virgin coconut oil is applied to the body which reduces tension build up. Introducing as well is Dagdagay which is basically a deep tribal foot and leg massage using clay to enhance the kneading motions while cleansing and purifying the skin. And to complete the luxury, have a moment of lull in the exquisite deluxe room, complete with practical amenities such as high-speed internet access, 40” full high-definition IPTV and the new remote jack pack plug-and-play system, luxurious bedding plus facilities such as outdoor pool and health club, among others. This promo is valid until June 30, 2010. 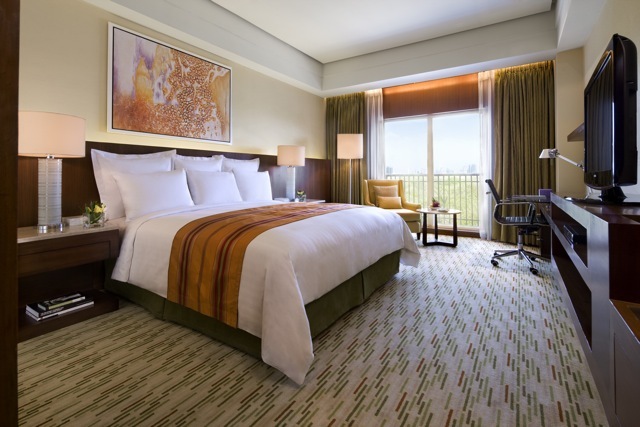 Marriott Hotel Manila is set in the world class tourism complex of Resorts World Manila. Ideally located in Newport City across NAIA Terminal 3 the hotel is a mere 15-minute drive from Bonifacio Global City and Makati Business District. Blessed with a splendid view of the adjoining 18-hole Villamor Golf Course, it boasts 342 exquisite guest rooms that offers luxurious bedding, high-speed internet, 40" full high definition LCDs with IPTV and the new remote jack pack plug-and-play system. Hotel facilities include Quan Spa, 6 meeting rooms and a Grand Ballroom, 5 superb restaurants, outdoor pool and a health club.